On Friday 21st September Positive hosted an educational visit for 10 A Level Product Design students. The students from Glenthorne High School, an outstanding National Teaching School with a specialism in the Arts, wanted to learn about paper printing and finishing techniques. Danny Sullivan said “We really enjoyed having the students visit. We are very keen to inspire the next generation and are planning several workshops for next year”. Each student received a pack containing a variety of samples of different printing elements, substrates and finishes. 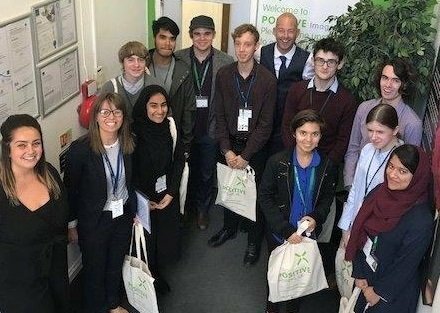 Image shows Sarah Carter (Sales Manager, Positive), Louise Bishop, (Assistant Headteacher and Director of Sixth Form, Glenthorne High School) and Danny Sullivan (Managing Director, Positive) with the A Level Product Design students.